Methanol, sometimes called “wood alcohol,” is a clear liquid with the chemical formula CH3OH. It is clear liquid with polar properties, making it a good solvent. It is also highly flammable, and highly toxic to humans if ingested. Historically, methanol was created when cellulose, the main sugar in wood and some other plants, was fermented by bacteria. This fermentation process led to a substance that was deadly to drink, but useful as a solvent for scientific and industrial purposes. After scientists discovered methanol and its uses, humans began to produce methanol for industrial purposes using a much faster process of combining carbon monoxide, carbon dioxide, and hydrogen gases along with a copper-based catalyst that prompts these raw materials to combine to form methanol. Methanol is used industrially as an ingredient in antifreeze, various chemical solvents, certain fuels, the creation of many plastics, and in blends of alcohol intended for medical or industrial use instead of consumption. “Denatured” alcohol used in medicine and industry often includes both ethanol (the same grain alcohol found in beer and wine) and methanol, which makes it toxic to consume. Because it can be produced from the fermentation of plant matter, methanol has been the causes of many fatal cases of poisoning from drinking illegally produced alcohol. During prohibition in the United States, amateur attempts at distilling liquor sometimes led to blindness, neuropathy, and death as a result of drinking methanol. In other countries today, major poisoning incidents still happen when unscrupulous sellers try to profit by selling home-brewed alcohol at lower prices than those offered by major retailers. Like formaldehyde, methanol is a simple enough organic substance that it can be created by inorganic chemical reactions. For that reason, methanol has been discovered by telescopes in some regions of deep space where no life exists. Methanol has many industrial and scientific uses. One of the most common uses of methanol is as an ingredient for formaldehyde. This chemical which can be derived from methanol is used extensively in the production of plastics, including those used in construction materials, car parts, paints, explosives, and wrinkle-resistant artificial fabrics. Formaldehyde is also used by morticians and scientists to preserve corpses and laboratory specimens. Methanol can be used to make other useful solvents including acetic acid, dimethyl ether, and propylene, which is used in anti-freeze. Methanol itself can also be an ingredient in anti-freeze. Fuel for both gasoline-powered and biodiesel vehicles can include methanol. Its highly flammable nature and usefulness as a solvent allows it to assist other fuels in blending and igniting. Pure methanol has even been used by itself as a fuel for race cars. It produces high speeds – but also led to a devastating fire which killed two American race car drivers. Methanol fires are especially dangerous because they are extremely easy to spark, and the flames are almost invisible. This allows the fires to spread out of control and catch other materials very quickly. Today, both the United States and Europe have safety regulations on how much methanol car fuel is allowed to contain. You may recognize that “methanol” shares a root word with the gas “methane.” The “meth” in both substances refers to this single carbon which is saturated with hydrogen atoms. 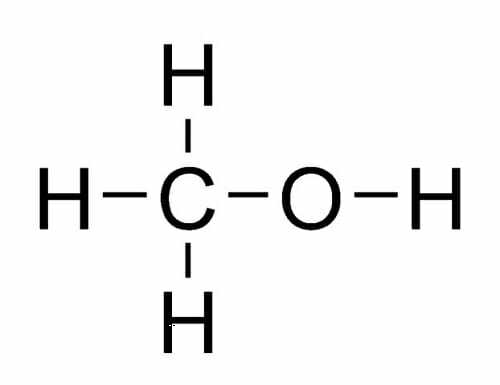 In “methanol,” this carbon is attached to an alcohol group; in “methane,” the carbon with four hydrogens stands by itself. Methanol is closely related to ethanol, or “grain alcohol.” Ethanol is the alcohol found in beer, wine, and liquor. Where “meth” refers to a single carbon saturated by hydrogens, the prefix “eth” refers to a chain of two carbons saturated by hydrogens. Ethanol, then, has a chain of two carbons where methanol has one. This extra carbon makes a very big difference to how our bodies metabolize the alcohols. While ethanol is safe to drink in moderation, methanol is broken down by our livers into formaldehyde – a highly toxic product that can cause blindness, nerve damage, and death. Because methanol and ethanol are produced through similar chemical and microbial processes, great care must be taken when fermenting and distilling not to contaminate drinking alcohol with methanol. The formula for methanol is CH3OH. It is most commonly created by reacting precursor gases such as CO and CO2 with H2 hydrogen gas. In the presence of a copper-based catalyst under the right conditions, the hydrogen atoms will bond to the carbon and oxygen atoms, displaying the double bonds between the C and O and resulting in a molecule that’s fully saturated with hydrogen. In the case of reacting CO2 with hydrogen, water is also created as a byproduct of the extra oxygen being saturated by hydrogen atoms. One major risk of working with methanol is fire. Liquid methanol burns easily and can be set aflame by any stray spark or excessive heat. Methanol is also very dangerous to ingest. Like formaldehyde, methanol is produced in tiny quantities by the activity of our own cells. However, also like formaldehyde, methanol is highly toxic to our cells and must be constantly removed and excreted through the liver and kidneys. When ingested, methanol is metabolized by the liver into formaldehyde, and then into formic salts. These are highly toxic to the nervous system and can permanently destroy the optic nerve, causing blindness. The neurotoxic effects can also cause coma and death. When methanol poisoning is treated properly, permanent damage can often be prevented. However, when left untreated, death from the neurotoxic effects of methanol can occur within hours of ingestion. 1. What does the “meth” in “methanol” stand for? C. “Meth” indicates that the substance is an alcohol. A is correct. The “meth” in methanol tells you that this chemical has a single carbon atom, while the suffice “-anol” tells you it’s an alcohol. “Methanol,” then, is an alcohol with a single carbon atom. 2. Which of the following is NOT a hazard of methanol? A. It is highly toxic if consumed. B. It is highly flammable. C. It produces a thick, foggy vapor which can obscure your vision. C is correct. Methanol is highly toxic and highly flammable. However, obscuring your vision is not a risk. It is an invisible gas and a clear liquid. This can actually make methanol more dangerous, as it remains nearly invisible even when it is on fire. 3. What would you expect to happen if you reacted carbon dioxide with hydrogen gas and a copper catalyst? A. Methanol would be created, with no other byproducts. B. Methanol would be created, with water as a byproduct. C. Methanol would be created, with formaldehyde as a byproduct. B is correct. In the reaction of CO2 with H2 gas methanol is created from the carbon + hydrogen + one oxygen atom, while water is created from the remaining oxygen and hydrogen.